After reading Bill Burge's (of stlbites.com) comment about cassoulet in November, I couldn't stop thinking about that Southern French dish. For those of you who aren't familiar with cassoulet, it's a slow-cooked stew typically containing beans, sausage, duck, and lamb. I've looked at several cassoulet recipes, but ultimately decided that it would be easier and cheaper to order it at a restaurant than make it at home...duck confit and all. Alas, I never went out for cassoulet this winter. 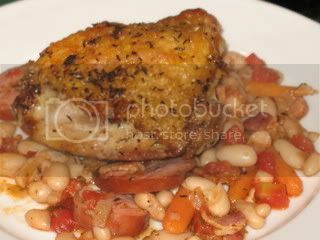 Instead, I made a quick version of cassoulet for dinner on Sunday--with chicken, sausage, bacon, & beans--adapted from one of those little Pillsbury cookbook pamphlets you see in the supermarket checkout lane. It's the first, and only, one I've ever bought, but I wanted to see if the recipes were any good. I really liked this cassoulet, which is actually just a hip, fancy way to mean casserole (casserole is like so 1970s)...and I will definitely make it again. Prep Time: 30 minutes. Start to Finish: 1 hour, 15 minutes. In a 12-inch nonstick skillet, cook bacon over medium-high heat until crisp. Remove & drain on paper towels. Reserve 1 tablespoons of drippings. Season chicken with salt, pepper, & thyme. Add chicken, skin side down, to skillet. Cook, turning once, until brown on both sides. Remove from pan. Add carrots & onion, season with a pinch of salt & pepper, to pan and cook about 5 minutes. In an ungreased 13x9-inch baking dish, mix sausage, beans, tomatoes, bacon, carrots & onions, and a teaspoon of thyme. Top with chicken, skin side up. Cover with foil. Bake 30-45 minutes, or until the chicken is cooked through (the juice should run clear & meat should register 180 degrees).